The very best thing about my work is the people I meet. While working on a project in Amstedam's dystopian Zuidas area earlier this month, I met Arjan. That's him on the right, with his Dad on the left. He showed me some of the bicycle-related products that their company, LoMinck, make. Then he surprised me. 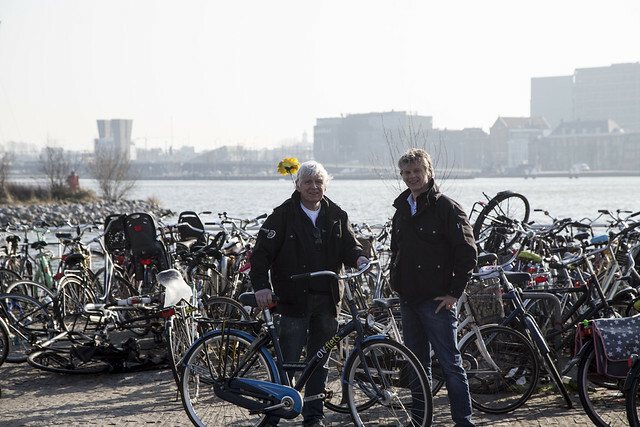 "We made the world's first automated, underground bicycle parking system." "What about the Japanese? ", I said, having seen the many films on YouTube about robotic underground silos for bike parking. He just smiled. "We were first. Ten years ago." I had to see it and we met the next day at the spot where the free ferries from Amsterdam Central Station arrive at Amsterdam Noord. I knew the non-descript little building where Arjan and his dad were waiting. I had no idea that it was, in effect, an important spot in bicycle history. Down into the bowels of the beast we went. Which was a short ladder trip, basically. 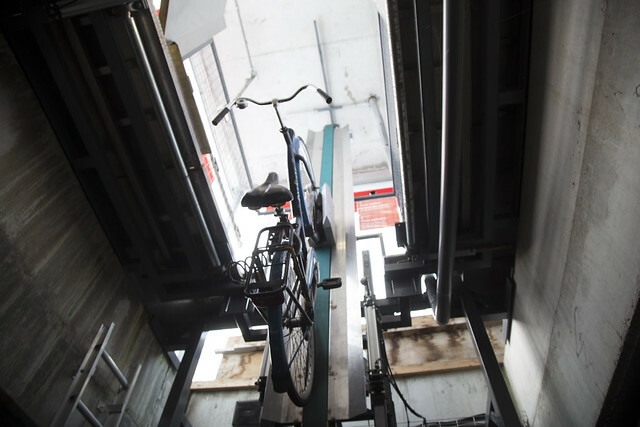 This bike parking facility isn't a silo but rather a horizontal room underground. If you look at the photo on the left, it extends from the building to the pole on the right. We were in a simple room with 50 bikes hanging on hooks. It all looked so simple. Like good design should look. Up top, his Dad put an OV Fiets bike into the system and we watched as the machine gripped the front wheel and it descended, placed on a hook like a drycleaned suit. Then up again it went. This modest facility was opened by the Dutch Minister of Transport in 2005. Subscribers pay €9 per month and LoMinck takes care of the remote monitoring, maintenance, customer service, breakdown service and subscription management. The city of Amsterdam pays an annual fee for this service. It doesn't have to be underground. It can also be implemented above ground or into buildings. The minimum required width is 3,5m, the minimum required height is 2,75m. 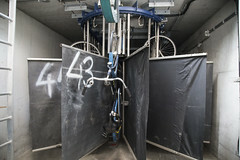 The length is variable and determines the capacity of the system; every additional meter creates 4 additional bike positions. I asked Arjan and his Dad what they thought about the Japanese systems. Arjan translated the question for his Dad who just smiled and replied, "Overcomplicated". But hey. There's more. Check this out. This is everything I believe in, in design. Simplicity and functionality. Stairs can be tricky with bikes. 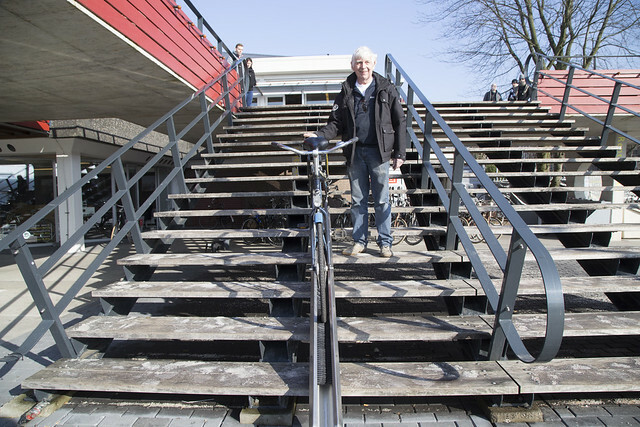 Most stairs in Denmark and the Netherlands have gutters to let you roll the bike up and down. How to improve the ease of use? Start with a broom. Tasked by the City of Amsterdam to solve the issue of a particularly steep set of stairs that cyclists were avoiding, the Minck family went through some designs and then found a broom in the kitchen. They cut it in half. Stuck the bristles together. Presto. Going up the stairs? How about a mini conveyor belt? Be still my designer heart. Don't even get me started on the VelowUp bike racks. Simple, functional design solutions. More of that, please. Check out their stuff on the LoMinck website.